PARIS? Satellite fleet operator Intelsat has successfully negotiated the passage ofits out-of-control Galaxy 15 satellite across the path of its Galaxy 13spacecraft with no signal interruption for Galaxy 13 customers in the second ofwhat likely will be at least four such maneuvers before the so-called"zombie satellite" shuts down on its own in August, Intelsat said. Galaxy15, which earned the nickname "zombiesatellite" after it stopped responding to commands in April, has since beendrifting eastward along the geostationary arc 36,000 kilometers above theequator. Industry officials say it is the first time an uncontrolled satellitehas remainedelectronically active, with its transponders still looking for signals torebroadcast even as it strays far from its assigned orbital position. Galaxy15 traveled through the orbital slot of Luxembourg-based SES's AMC-11satellite in mid-May. 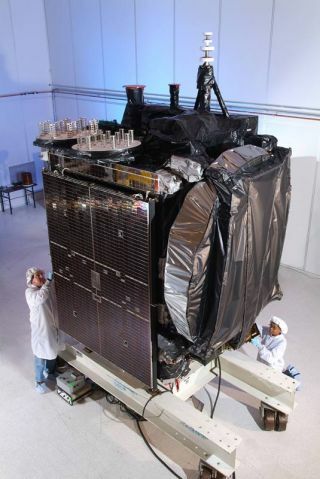 That event caused no service disruptions as Intelsatand SES took measures that included routing some AMC-11 traffic through a19-meter-diameter antenna at Intelsat's Clarksburg, Md., teleport. Unableto shut the satellite down, Intelsat officials then prepared for the Galaxy 13fly-by July 12 and 13, using some of the same interference-avoidance techniquesdeveloped for the AMC-11 encounter. Theprocedure was completed "without incident," Intelsat Chief TechnicalOfficer Thierry Guillemin said in a July 15 statement. "We will now beimplementing the interference-mitigation plan for the fly-by of Galaxy 14, expectedto occur at the end of July." Luxembourg-and Washington-based Intelsat said that at one point during the Galaxy15 transit through the Galaxy 13 orbital slot, the two satellites werewithin 0.05 degrees of separation. Some customers continued to use the Galaxy13 and were able to do so because the satellite's signal reception had beenreset as low as possible to permit signals to be sent without attracting Galaxy15's interest. UnlikeAMC-11, Galaxy 13 also carries Ku-band transponders in addition to its C-bandpayload, meaning Intelsat was limited in its ability to move the satellite tothe extreme eastern edge of its orbital slot to avoid Galaxy 15 beforeperforming a "leapfrog" maneuver back westward as Galaxy 15 continuedits eastward move. Galaxy15 is on course to enter the Galaxy14 orbital neighborhood in late July, with a peak interference threatexpected July 30, according to Intelsat. In mid-August, it will be Galaxy 18'sturn to avoid Galaxy 15. Intelsatofficials are hopeful that sometime in mid-August, Galaxy 15, whose attitudecontrol is slowly degrading, will lose its lock on the sun. Its power will thendrain and the satellite will shut down on its own. Intelsatis already preparing customers using Galaxy 23 for a similar avoidanceprocedure in late August in the event Galaxy 15 is still active by then. Thecompany has also begun coordinating with satellite fleet operator Telesat ofCanada, whose Anik F3 satellite will have to contend with Galaxy 15 inmid-September. Life's Little Mysteries: How Much Junk is in Space?